Points of zero charge were determined on two highly weathered surface soils from Puerto Rico, an Oxisol and Ultisol, as well as mineral-standard kaolinite and synthetic goethite using three methods: (1) potentiometric titration measuring the adsorption of H+ and OH− on amphoteric surfaces in solutions of varying ionic strength (I) (point of zero salt effect), (2) direct assessment of surface charges via non-specific ion adsorption as a function of pH and I (point of zero net charge), and (3) electroacoustic mobility of reversible particles as it varies with pH and I (isoelectric point). The first two methods yielded points of zero charge for kaolinite (2.7–3.2) and synthetic goethite (7.4–8.2) comparable to those reported previously, indicating the reliability of these analyses. The soil values ranged from 3.9 to 4.4 for the Oxisol and 2.3 to 3.7 for the Ultisol. Electroacoustic mobility, as measured by the AcoustoSizer™, is a parameter that has yet to be thoroughly tested for mineral or soil systems as a viable alternative to PZC assessment. 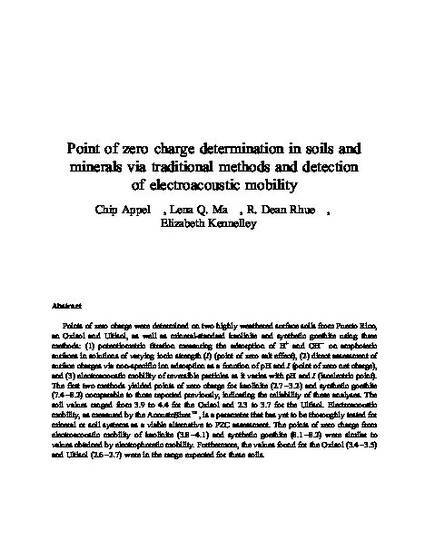 The points of zero charge from electroacoustic mobility of kaolinite (3.8–4.1) and synthetic goethite (8.1–8.2) were similar to values obtained by electrophoretic mobility. Furthermore, the values found for the Oxisol (3.4–3.5) and Ultisol (2.6–2.7) were in the range expected for these soils.